For many of us, the thought of “exercise” conjures up images of squeezing into tight Lycra and cavorting around at the gym for an hour or so. It’s a hobby for some and a nightmare for others. Moving, though, is something that everyone does every day, even if it is just walking down your driveway to get into your car. But the way Apple defines movement and exercise is rather different. In fact, from your Watch’s point of view, the time you spend at the gym is not necessarily exercise. But that walk to the car just might be. That’s why when you log a workout, it doesn’t always contribute the same number of minutes to the Exercise ring. For example, if you use the Workout app to log a 30-minute walk, it might not be enough to close your Exercise ring, even though the goal for that ring is 30 minutes. The problem is that a leisurely stroll does not raise your heart rate much, so it might not be sufficient to contribute any minutes to your Exercise ring. Similarly, if you are lifting weights at the gym, you might be working your muscles very hard. However, if you sit down and rest between sets, your heart rate may never become sufficiently elevated for your Apple Watch to consider what you are doing exercise. As such, the Exercise ring tends to be a little harder to close than the Move ring. That’s because it is concerned with the quality of your activity, not just the quantity. You can force your Apple Watch to credit you with all the minutes of your workout by using the Other workout option, since this assumes you are working out at the level of a brisk walk or better, regardless of your heart rate. But that’s kinda cheating. Run rings around the Activity app. To understand why we have separate Move and Exercise rings, let’s pause for a brief history lesson. 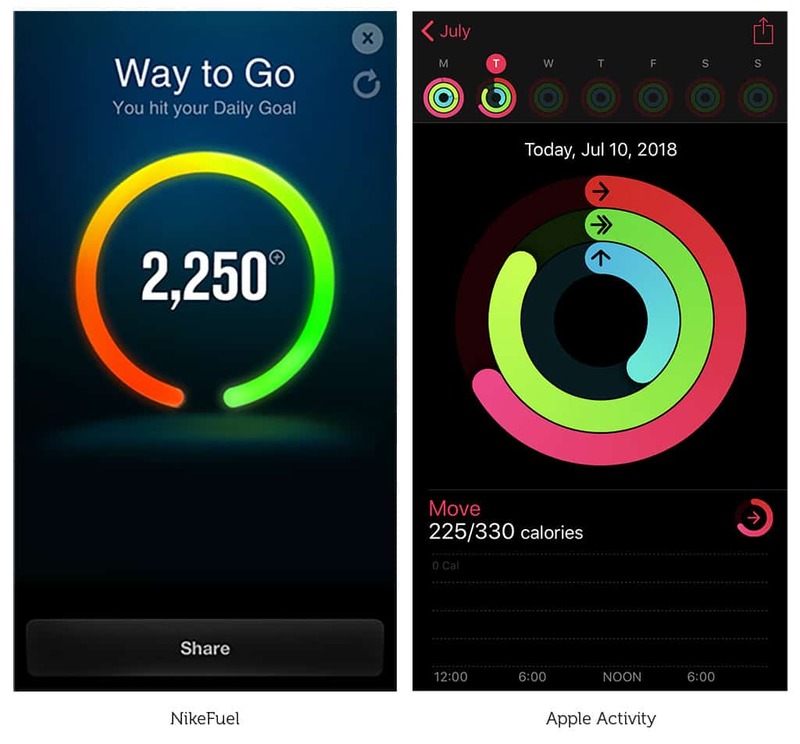 The forefather of today’s Activity rings was NikeFuel, which was introduced back in 2012 together with the Nike+ FuelBand. At the time, Jay Blahnik was a key expert and consultant at Nike. Today, he’s the director of fitness for health technologies at Apple. So it’s no surprise that there’s a strong family resemblance between the NikeFuel ring and Apple’s Activity rings. Like the Move ring on Apple Watch, the NikeFuel ring was a measurement of your movement throughout the day, gauged by the motion of your wrist. It was pretty basic. But it was all that was possible with the hardware in the Nike+ FuelBand at the time. The trouble is that fitness is a multifaceted concept. There is far more to it than just movement alone. Thanks to advancements in hardware like the built-in heart rate sensor and a powerful processor, Cupertino was able to take things further with Apple Watch by adding two more rings, for Stand and Exercise. Some aspects of fitness, such as strength, flexibility and coordination, are still not covered by Apple’s three-ring model. But it is still a big step forward from the single ring of its predecessor. NikeFuel’s ring looks a lot like the Apple Watch’s Activity rings. Why is the Move ring the only customizable one? One big difference between the Move and Exercise rings is that only the move goal is customizable. The exercise goal is the same for everyone. 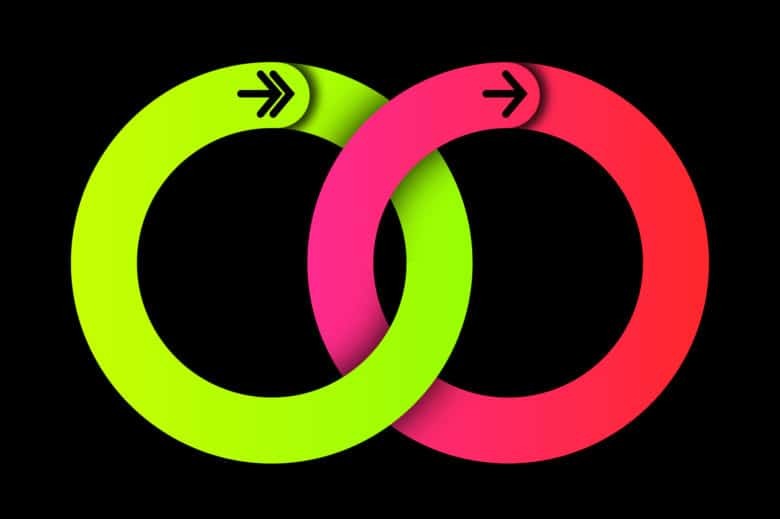 Like the NikeFuel ring before it, the Move ring lets you choose the number of calories you aim to burn in a day. (Nike called its units “Fuel” instead of calories, but it was basically the same thing.) This flexibility means the Move ring is great for pretty much everyone. Whether you are a couch potato or an Olympic athlete, you can pick a goal that’s realistic for you. Another neat thing about personalized move goals is that they level the playing field for Apple Watch Activity sharing. A bit like a golf handicap, you can compete with friends and family to close your Move ring, even if you all have very different fitness levels. So why didn’t Apple go the same route with the Exercise ring? Why do we all get the same fixed 30-minute goal? It might seem unfair that everyone gets the same Exercise goal, regardless of their level of fitness. And it would be, if that were true. But in reality, it is not that simple. The duration may be 30 minutes for all, but the intensity varies for everyone. That’s because our bodies adapt to exercise when we do it frequently. As you get fitter, your heart becomes stronger and more efficient. It does not need to beat as fast in order to supply the oxygen your muscles need during exercise. The fitter you become, the less your heart rate will increase when you do the same amount of work. Since Apple Watch uses elevated heart rate to judge when you are doing exercise, a very fit person must work a lot harder to elevate their heart rate sufficiently for it to contribute to their Exercise ring. In other words, a brisk walk might count as exercise if you are unfit. But as you get in shape, it might not, because it would not elevate your heart rate much. Then you might need to jog or run to raise your heart rate sufficiently for it to count. But why is it 30 minutes exactly? Apple has not explained exactly how it arrived at 30 minutes for the Exercise goal, but it is probably based on the World Health Organization’s recommended levels of physical activity for adults. The WHO recommends that adults do at least 150 minutes of moderate-intensity activity each week, which works out to about 21 minutes a day. For additional health benefits, WHO recommends aiming for 300 minutes a week, or 42 minutes a day. Apple set its 30-minute goal right in the middle of the WHO guidelines. Apple’s Activity goals are really just a means to an end. Moving a certain amount every day, and doing 30 minutes of exercise, are not things most of us do just for the fun of it. We do them to maintain or improve our health. If your answer is that you want to lose weight, then the Move ring is very important. That’s because this ring is measured in calories. As everyone knows, counting calories is important when you want to shed pounds. If you just want to live a long and healthy life, then the Exercise ring is important. According to the WHO guidelines, the Exercise goal reduces the risk of diseases such as coronary heart disease, high blood pressure, stroke, type 2 diabetes, metabolic syndrome, colon and breast cancer, and depression. It also reduces the risk of hip or vertebral fractures. 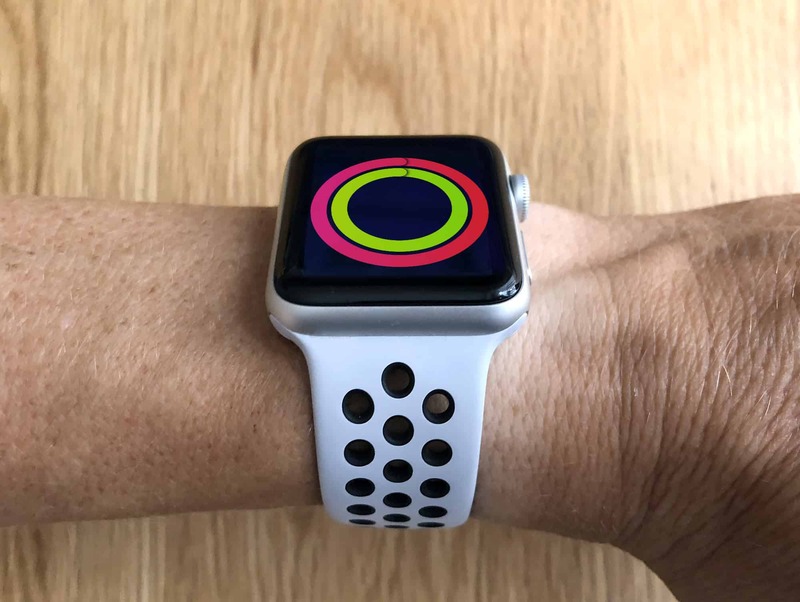 The pink and green Activity rings on Apple Watch may appear similar. However, as we’ve seen, in reality they are very different. Put simply, when you are exercising, you are also moving. But when you are moving, you are not necessarily exercising. For your movement to count as exercise, it must be a moderate-intensity activity that raises your heart rate. If you want to maintain a healthy body weight, and reduce your risk of premature death, you need to make sure you’re doing a bit of both. Thanks to Apple Watch, that’s easier than ever.